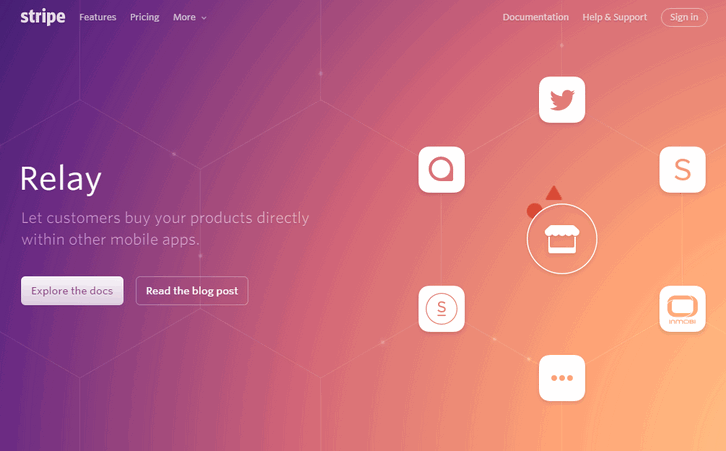 Stripe has launched Relay, an API for stores to publish their products, and for apps to read them. Relay makes it easier for developers to build great mobile e-commerce experiences, and for stores to participate in them. Relay powered by a few new objects in the Stripe API: Products, SKUs (product variants), and Orders. Stores can provide product information to Stripe via the dashboard, the API, or by linking their existing e-commerce systems. SAP Hybris (used by stores like Levi’s, Oakley, and Ted Baker) is the first e-commerce integration we’re announcing, but expect more to come later. For stores, you can use Relay to enable instant purchases in third-party mobile apps: one of our launch partners, Twitter, is using Relay to enable anyone to start selling within tweets. Or you can submit your products to be shown in a growing number of apps like ShopStyle and Spring.